Subnautica has amazing potential, and I have been thinking considerably about some of the aspect of the game, story wise, and would like to share these ideas with the community and with the developers. This may be a long post, so please bear with me. One of the reason Frank Herbert's Dune was such a success is the amount of sheer data that Herbert created as a background behind the ecology of Arakis. Subnautica has that potential. What is the relationship between fauna and flora? What creatures eats what other creature, which in turns eats what other flora? This is important, first, because it determines how the fauna and flora may be generated in the game, and how eggs are spawned. I think this idea alone has HUGE potential. After all, this is a game that postulates you arrive in a new planet to terraform it. What are the impact it will have on the life around you? What if you find out much later in the game that some creatures are sentient and they are starting to be affected by your meddling? There is already an awesome DNA aspect being developed in the game, where you would collect DNA samples from various creatures to transfer in yourself or other lifeforms. Your PDA could have an additional tab for scientific research. Each life form, fauna, flora and technology can be listed there. At first you only have an approximate description: "This fish is blue with a single big eye on it's belly. It seems quite fast and difficult to catch" no nutritive description is displayed. Some lifeforms may be poisonous. You will find out when you eat it! Some lifeforms may hurt you - like the acid mushroom. The initial description would only say "Bright purple mushroom-like plant. Seems to retract itself when approached." When you try to eat it you get damaged and the PDA now says "Pure acid"
The fabricator will show you can build a battery out of acid and copper, but won't allow you to use acid mushrooms until you found that they are acid. Only by researching the life form (or its DNA) through the use of some sort of laboratory can you arrive at the full description of it, including its place in the ecology (see above) i.e., who eats it, where it lives, what it needs to grow, and of course what its DNA can do using the injector. One way to keep track of the evolving story while staying in a sandbox type of environment is to use the concept of a scientific diary. As the player reaches certain important milestones in the story, we could see him take his PDA and start recording his personal notes on what he goes through. 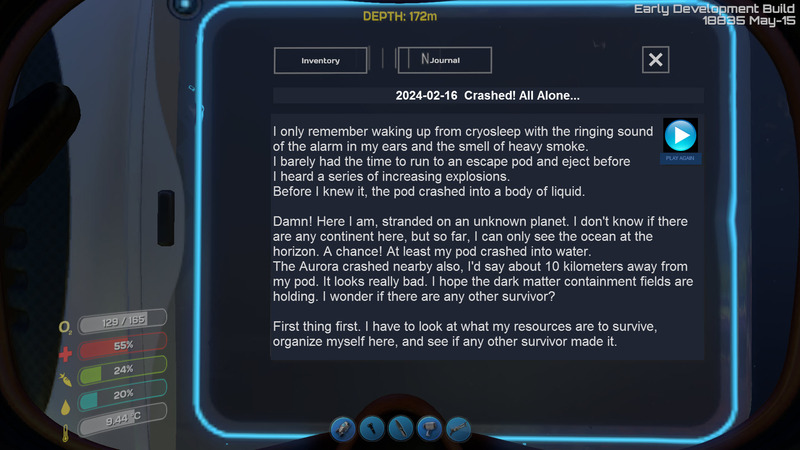 Perhaps at first he is recording a journal in the hopes of being rescued soon, by the people who are supposed to arrive after the terraforming (or by a rescue team who knows the Aurora went down). Perhaps he knows he is stuck all alone and is recording his thoughts not to become mad with loneliness. 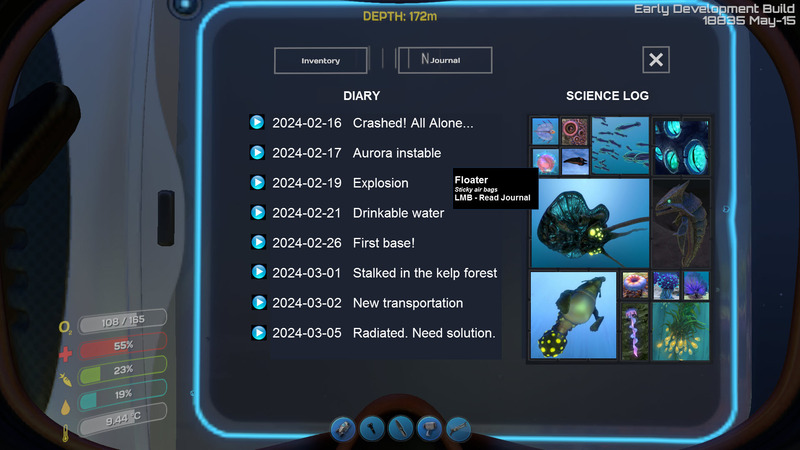 As the story advances and you discover what caused the Aurora to crash, the journal could be a great way to keep track of it, as a game mechanic. Ultimately, what if the character discovers that this ocean planet is actually inhabited by sentient beings? That would make for an amazing plot device. Think of a life form like our dolphins: they are amazingly intelligent but communication requires devices (like sonars) as well as developing a "code" to understand each other. As the story progress, the player would have to learn that some sentient creatures change their behavior depending on his actions, and eventually a technolgoical device can be crafted to enable sign or coded language. Maybe the sentient beings are the reefback? If several different sentient life forms are at war with each other? If the only sentient life form need your help against reapers or other kind of problems? If you could call some life forms for help, for instance calling a reefback to protect your from a reaper and chase away the dangers, or to repair your sunken cyclop with sticky goo inside the hull breaches? Maybe you have a limited number of days before your rescue party arrives, and depending on your situation with the sentient life form they may end up killing them or helping them? Enough idea for a single thread. I'd really like to see proper mechanics for food chains, breeding and habitats. Not much to comment on this for now. Yeah, sounds cool! But the system should be a little bit forgiving, so newcomers don't accidentally cause mass extinction next to their life pod. Too complex = too hard to maintain and improve. This actually sounds better than it seemed at first. Some kind of PDA diary would add to the atmosphere. But it's kind of minor feature, so if it's coming to the game, prepare to wait a long time. While I'd like to see "alien dolphins" in the game, I don't think they should have highly civilized behavior. I mean, waging wars and such. IThe creatures would be friendly and playfull, and you could have them as friends / pets. Also I don't think reefbacks should be sentient, because they are really sluggish and look pretty dumb. You will be able to harvest plants from a special biome growing on reefbacks' backs, so they will have their purpose that way. Also reapers can kill them, so they can't really save you. I think the size of these kind-of-intelligent creatures should be around the current sharks, or little bit bigger. Having limited days for something is a really bad idea in my opinion. I like the freedom of the game, so any deadlines would just push you to do things fast and discard all extra exploration and creativity. That's why I'd prefer that you have to contact humanity some way first. You'd have the freedom to bring the story to an end when you feel you'r ready for it. Getting the contact would require lot of exploration too, so those who want goal oriented gameplay can get little bit of that too. I don't want the game to have conclusive ending either, so the people who you invite to the planet are not on a rescue mission, but instead come to complete the terraforming mission of Aurora. Five thousand times yes to the concept of an ecosystem. The idea of the main character telling us a story seems off. I'm sort of fond of the open ended style, and would prefer that (us) the protagonist remain anonymous. I would however like to be told story bits from the game itself (finding entries/data in the Aurora, or give meaning to the tech fragments this way as well). To sentience....maybe? I would like to have interaction limited to be very simple. Similar to the relationship between the player and villagers in Minecraft, albeit not so bland. Trading, maybe some nature of faction based relations. I don't think I'd ever want to progress to true 1:1 understanding/interaction with them though. I agree with the above on limited days being a bad idea. I'd rather have the game take a hands off approach with the story. Let us find it, interpret it, and it that way make our own story to an extent. There's a definite psychological 'distance' being maintained between the avatar and player at the moment. As far as I can tell, players care more about what happens to a Seamoth or Cyclops, rather than the poor little meatbag cowering inside a rapidly collapsing Plasteel hull. Even a few appropriate vocal interjections at certain points in the game would go a long way toward making it easier to directly relate to the central character. Shouldn't take that much effort to implement a range of male and female sound clips that comment on particular situations, and the payoff in enhancing gameplay immersion would be well worth it. This feature could also be extended to include developing a symbolic visual language for the purpose of communicating with any sentient life the player may encounter. An early French computer game called 'Captain Blood' (1988) used a 150-character symbolic language for the same purpose, and made an otherwise straightforward FedEx Quest-style game an extremely interesting experience. Some players invariably found 'Captain Blood' to be too confusing to play, mainly because it was a bit difficult to interpret the symbols and use correct syntax to convey the player's intentions. Again, this could be streamlined and assisted by mouse-over popups for each symbol. Linking sound files to each symbol could also be implemented. Imagine that you have encountered a presumably sentient creature, say a Reefback. Bring up the Communications pane on the PDA, and press the tab for 'Reefback'. Next, press the tab for 'Greetings!' The PDA will play a soundfile (obtained by using the Acoustic Analysis skill), and the Reefback will respond by echoing the hailing call. Any further sounds emitted by the Reefback will be translated by the PDA, so that the player can craft a range of appropriate responses using an array of icons automatically generated on the PDA's Communications screen. Your next task is getting a Reaper Leviathan to say something other than "CRUNCHY FOOD! ME WANT!" @Srg_Silver That intro idea sounds awesome, it would give a nice kick straight into the game. yup i also like the idea for the intro very much. generally very good ideas. life on earth is expensive but every year you get a free trip around the sun. Since it takes the terraformer tool to change your environment, you wouldn't have that right from the start anyway. Agreed that it needs to be fairly simple. Example: acid mushroom need their mushroom base to grow. Terraform that away and you no longer have acid mushrooms. But you could (through research and DNA) eventually add an option on your terraformer tool to add (or move existing) acid mushroom bases, so that acid mushroom could grow where you plant them. Say now that Peeper spawn rate depends on the presence of acidic water. The more acid mushrooms are present, the more likely you are to see peeper fish. Say peeper fishes are eaten by reefbacks? then more peepers means more reefback spawns. And so on. Not too difficult. I like the idea of an explicit basic analysis tool, if we would see it and use it on purpose. But the acid shroom suggestion isn't complicated! The basic analysis tool of all time since the dawn of time has been... eat a piece of it and see what happens. So the acid shroom would just show at first "Pretty glowing mushroom". The "eat" action is always present on EVERY lifeform. When you first eat an acid mushroom that has never been analyzed through other technological means, you get a small health debuf, say -5% and your character goes "Ouch, my mouth hurts!" and your journal now adds an entry and you can hear your character say "Today I tried to eat one of these pretty mushroom that grows next to my pod. Bad idea! These are full of acid! Good thing I only tried a little at first. Good to know though, maybe I can use these to make batteries, if I could just find some cooper..."
I see it as a major feature (although minor in terms of difficulty or development impact) because it's what makes the whole "sandox" experience linked together as a proper story. Which is the MAJOR problem with sandboxes. Sandboxes are awesome because you can do whatever you want in the order you want. That's great and all, but they also suffer from the flip side: you eventually get bored because there is no story or sens of accomplishment outside exploration or crafting. The diary would act, sort of like a sauce, linking all the elements into something coherent, even if you take your time to do it the way you want and in the order you want. This is EXACTLY what I had in mind, but you explained it SO MUCH better. Thank you! So as you would research the sentient life form, each additional research would enable you to discover a new sign and develop your language. Research 1: Oh there is this big huge creature, let's call it a reefback. So strange! Research 2: It seems friendly. It didn't attack. Seems to follow me around. I am going to have to investigate this more. Research 3: Today I made a sound by tapping on the hull and the reefback made a sound too. It seems to be copying my sound! There is so much potential with this idea. Maybe the reefback (or whatever sentient creature you find) can ally against a major threat in the ocean and help each other? I sort of like the idea of some sort of very basic communication with some creature, maby stalkers? They seem a bit like dolphins. I don't really think that the reefback should be that creature, as for one thing, they seem to be based on jellyfish, which quite literaly don't have brains, and for another, they don't really seem to react to their environment at all, they just cruise around. A totally new creature would be better, or failing that, possibly stalkers, maby they want help against bonesharks? They seem like counterparts to stalkers, so they might conflict. I love the idea of gathering data and doing recearch on the animals. We should definately have some tools for this and a wiki kinda log. My comment on the intro idea.. I'd rather keep the current idea, and not see what goes on. Why? Well because it is so interesting to imagine a million different reasons why I survived, and the rest didn't. Why was I able to make the escape pod that launched and saved but no one else could? Was it a divine miracle? Was I in on the whole thing? I play my games of subnautica depending on the reason I create for my survival during the loading screen. The ecology idea is really awesome and also could imo provide very much depth (pun almost intended) for gameplay. Maybe the player can / even has to find out WHY some changes occurred? Or maybe mission goals could be to increase the population of a specific species? After all, we're to make the world colonizable ^^ However I'd really like to see the game to show the player that oecological changes can sometimes backfire because one did not expect a certain reaction. 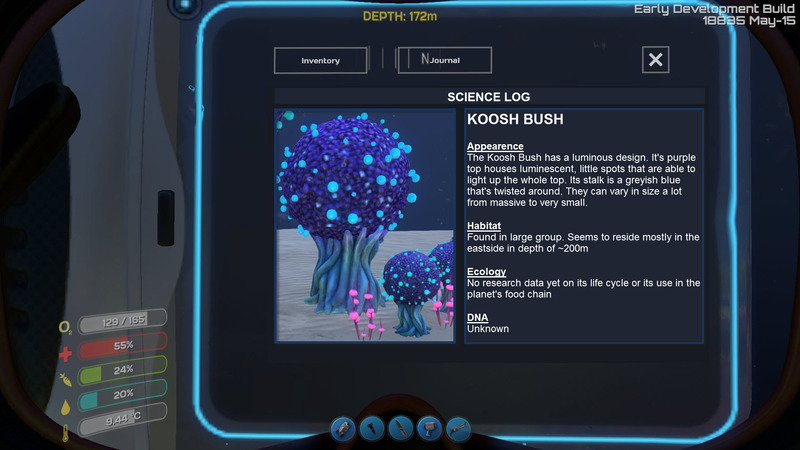 To find intelligent life in the depths also sounds very interesting, maybe interactions with these creatures might be interesting for the story arc as well? in the story make it where we find another human that story mode, then there is free roam and multiplayer. If i understood your point correctly, I believe I thought about something similar last night. If/when there is going to be a multiplayer, it might be interesting if every player started their game scattered around the map with no knowledge of one another. Maybe even without a functional life pod in the near vicinity, but instead a sunken/ruined life pod; maybe only one of the players spawn in functional life pod (with a fabricator) with low power or so. This would make an interesting, yet small "first challenge" for multiple players which would emphasize the survival aspect in the beginning as everyone would need to find each other (with beacons or just looking around in the surface) with hunger and dehydration slowly creeping up on them. Playing with a friend is great but i kinda feel that the loneliness is sort of the signature of the game so far. I don't feel like just the fact that the player is alone is really a good premise for a game. The focus of the game, I feel, ought to be exploration, construction, survival, and just the fact that it is a big virtual fish tank. Discovering all the cool content in the game seems like it would be much more fun with a friend. However, I think that big servers would be a terrible idea, it would ruin the atmosphere to have a base and a submarine every few feet, and of course, greifers could make it like Rust. However, I think that big servers would be a terrible idea, it would ruin the atmosphere to have a base and a submarine every few feet, and of course, greifers could make it like Rust. I agree. I think the optimal amount of players for multiplayer could be something like 1-4 or so. Even 4 might be too much. Then again I think it's a bit too early to speculate about multiplayer. Also a bit off topic (well I started it . -Exploiting the variations in play and reacting to different kinds of night and day creatures. -Geological data. If the player could collect data explaining the ecology so the player has to be forced to venture to different areas. The fact that the planet is largely covered in water (Guessing.) could suggest a massive amount of liquids, extremely high gravity and-or atmospheric pressure making solids more brittle under pressure, relative to the pressures that made them. I'd like to see the atmosphere itself be more ambient. No one likes nor cares about the air, but I'd like to see fog, I'd like to see enormous pillars of clouds that may or may not loom over head. I'd like to see enormous manta-ray fish that actually hop from area to area and that the player could ride to traverse enormous distances making the submarines relatively non-dependable/irrelevant. Lightening. I would like to see lightening that could be a high risk high reward feature which would reward the player for having an exosuit that could nullify the effects of a direct strike but if the lightening got close to hitting the player but hit the water instead, it would be interesting to see a lot of dead predators and prey, all dead and ready to harvest. It would also be nice to be able to monitor food in terms of calories taken, calories left. Like how many calories you need to survive. I'd like it if the game was very technical but illustrated difficulties while educating the player inadvertently. I do not need a game to educate me, I want a game to challenge me logically. That being said, it would be an interesting mechanic if the character only ate slow easy prey and then over time they all became faster especially in a cave or very small biome, to see survivors(aquatic organisms) have progeny and those offspring would be as fast or slightly slower and slightly faster than their parents....but that is a minor change. It could be severe though especially if you remain in one area, like a cave or enclosed biome.